Snowfan replied on December 9th that 2018 could not be “the driest year” because the German Weather Service knew plenty of precipitation was in the pipeline for December, 2018. As Snowfan shows, the old record of 555.1 mm/m² of mean precipitation across Germany was set way back in 1959, (see chart below). Germany’s mean annual precipitation since 1881. 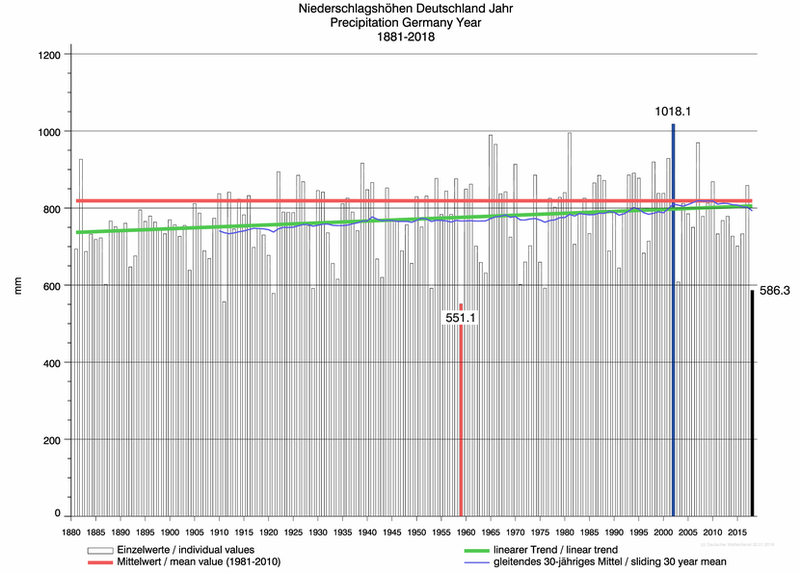 The green line shows how Germany’s mean precipitation has increased over the past decades. The 1981-2010 mean is close to 820 liters/sq m.
By the end of November 2018, an average amount of 482.3 mm/m² of precipitation had fallen in 2018 through November. As of December 8, 2018, an average of about 518 mm had fallen across the country. 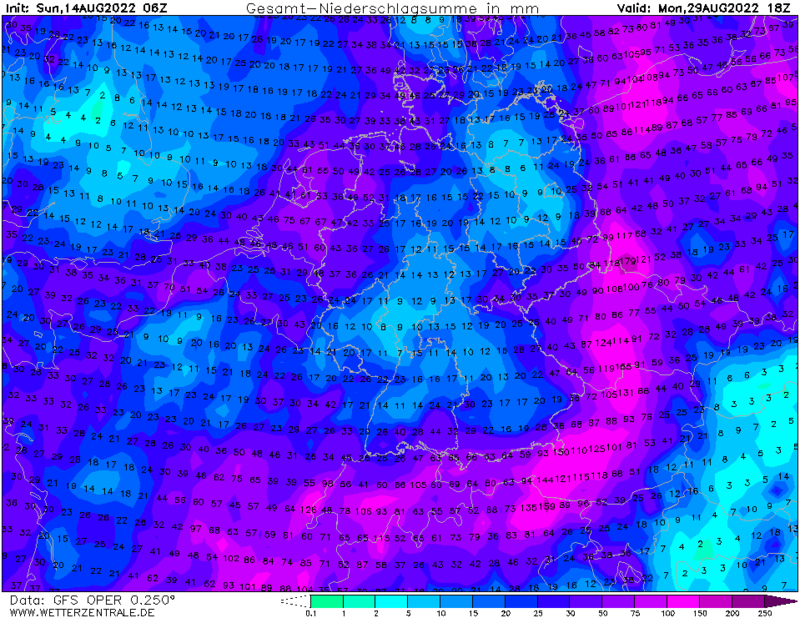 Defying the the GFS forecasts, the DWD went ahead and “expected” less than 30 liters/sqm of precipitation to fall across Germany by the end of the month. The purposely very low expectation of course allowed DWD to issue an alarmist press release warning that 2018 could set an all-time record for the driest year ever. 1. The year 2018 in Germany cannot be the driest year since 1881, the positive linear trend of precipitation in Germany since 1881 (green line in the DWD graph above) will remain. Today Snowfan writes that as of December 16, 2018, already about 81% of December’s mean precipitation has fallen so far. 1959 was the record driest year ever, and will remain Germany’s record driest year until further notice – no matter what the DWD may insist. The DWD thus knew before the December 3, 2018 press release of the climate fairy tale of the driest year ever, and that there would be more heavy rainfall in Germany by the end of the year. I wonder why no “bonafide Climate Scientists” saw fit to point out the DWD’s [deliberate] “error”? / sarc off. Of course it’s due to one key reason: if it fits the narrative, details don’t matter (the ends justify the means). Sadly, this doesn’t apply just to climate reporting and climate policy propaganda; it is de facto entrenched in the field of climate science itself! For the marriage of politics and research has created a mutually-reinforcing conundrum, a symbiosis whereby each player knows his role: support the cause and you will be rewarded! If your paper supports the narrative, it will be waved on without particular scrutiny; if it sounds particularly dire, you will be assured future grant money. If you dare challenge the narrative, you and your colleagues will be attacked, publications daring to publish your results will be threatened to retract and apologize. Perhaps this will require an extended cold spell to undergo the necessary correction in the near future. But correction will come sooner or later. mm/m² makes no sense. 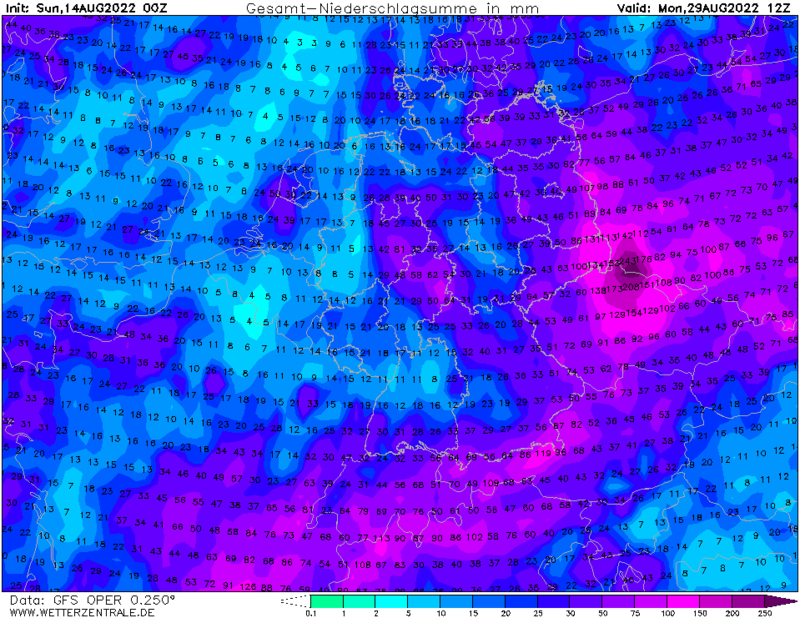 If you want the height of rain fallen, it will be the same no matter what area it’s over. Height per unit area is meaningless. Do you just mean 482 mm? Rest of the article is clear, after fiddling with units conversions. Personally, I would have said it will be nothing special. A quick count on your chart shows ~10 years with precip. at or below 600, so even if you are 15% below that, it is no big deal. Many weather variables have high variability (σ), so unless presented in an appropriate manner, it is meaningless. Also, I would not claim the forecast is a lie, even if it does turn out to be false. Our local weather report claims our temperature is expected to be 35°F (1.67°C) today, but it is already at 37°F. They are already wrong, but is it a lie? Statistics also apply to the forecasts. It’s not a lie if they get it wrong on the high side as often as on the low. BUT if they consistently get it wrong to one side or the other, that is at the very least a bias. And, if they are known to exaggerate to advance an ideology, and they consistently err on the side that favors that ideology, well, maybe they technically aren’t lying to us, but they are at least lying to themselves. It’s what climate alarmists do. Usually these events happen a bit later in the winter, and often cause a displacement of the polar vortex, moving the cold polar air out towards the temperate regions of the Northern Hemisphere. A similar thing happened earlier in the year (February-March) giving the UK its “Beast from the East” and a general European late snow event. And back then I noted that many alarmist screeched that this was evidence of CO2 Polar warming when it was not. It’s just what often and quite naturally happens during a solar minimum. So Pierre get ready for the new year bull$ħıt to arrive.